Just a short stroll through Krakow’s Old Town reveals the cosmopolitan nature of the city. Gaggles of Erasmus students bounce from lecture to lecture, international businessmen dash to meetings and signings and openings, workers from all corners of the globe banter in bars in many tongues. While it may seem easy to spot the non-natives prowling about the Rynek, whether due to their complexion or clothing or half-stuttered attempts at Slavic syllables, one of the largest international groups in the city is also the least conspicuous – the Ukrainians. They tend to integrate quickly and easily, learning the language and adopting the local culture faster than most other nationalities. 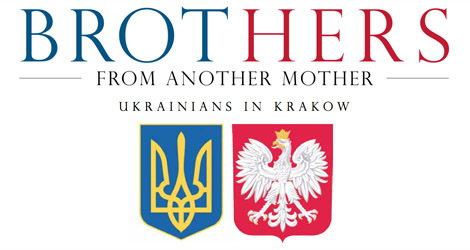 No surprise there, Ukraine and Poland share a long, tangled history – brothers from another mother, sisters from another mister, so to speak. Lviv, affectionately referred to by Ukrainians as Little Paris (and by Poles as Lwów), was a Polish city for more than a few centuries. In 1658 it was even declared equal in prestige to Krakow by King Jan Kazimierz, thanks to its heroic stand against invading Swedish armies. No wonder then that Ukrainians, especially those from the country’s western regions, feel so at home here. That isn’t to say the two countries are entirely brethren without estrangement. The border between Ukraine and Poland, patrolled by border police and armed customs officers clad in military fatigues, remains one of the most heavily guarded of the EU, with queues in either direction taking several hours to pass. And recent political unrest throughout Ukraine presents another stark border between the Ukrainians and their Polish counterparts: that of geo-political alignment. As the lulls of Christmas tunes float through Krakow’s main square, the squares of Ukraine reverberate with the chants of anti-government protestors. Sparked by Ukrainian President Viktor Yanukovych’s decision to suspend trade and visa agreements with the EU in favour of closer ties with Russia, mass demonstrations flared up across the country. Demonstrators, many of them students, have taken to the streets, from Kiev to Lviv, demanding an EU-oriented future for a Ukraine free of Russian influence. “I saw an advertisement that Ukrainian graduates could study in Poland, and I thought, ‘Why not?’” Daniil sees a warmth in the Poles that allows him to feel at home. “I went on a tour of Poland and visited many towns and universities. I found the Poles very friendly and hospitable to Ukrainians. A little later, I began learning Polish and decided to come here,” he said. The protests back home initially filled him with ‘delight and pride.’ “Students took to the main squares of the country to defend their interests and fight for the future. It was fine,” he said. However, he has become more cynical. Exhibiting the wariness of someone who has already experienced one, failed pro-Western revolution, the demonstrations no longer fill him with hope or delight. He now sees the protesters as being manipulated by the opposition. Andrei Sidorenko came to Krakow later in life. Originally from Kiev, he is an online media professional with a young family. Although he describes his emigration from Ukraine to Poland as ‘running away’ and a ‘plan B,’ he is seeking permanent residency here. Comparing his new home to Ukraine, he says: “The environment is much calmer here. People value the privacy of others.” The schools, too, he finds: “Much calmer. Less stressful for the kids.” He also enjoys access to Western financial services, such as cheap home loans. I am an American Architect. My heart goes out to these people.